World War II history, birdwatching, scuba diving ... what's not to like about Bell Island. 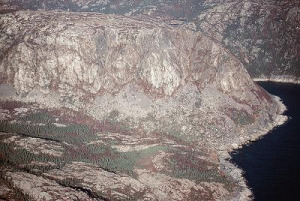 Bell Island is the largest of the islands in Conception Bay at 9 km (5.6 mi.) by 3.5 km (2.2 mi.). A 20 minute ferry ride from Portugal Cove, which in turn is a 20 minute drive from St. John's, takes you to Bell Island. Bell Island has giant murals that celebrate the Bell Island's rich heritage from farming origins to its mining peak. The local museum presents samples of the ore that made Bell Island one of the richest and oldest mining operations in the world. Try the mine tour, which will give you an appreciation of underground life. A unique historical note: Bell Island was the only North American locale to have battled the Germans during World War II. In 1942, The pier where 80,000 tons of iron ore was waiting to be shipped was torpedoed by German U-boats. At low tide you can see the relics of the 4 ships that were sunk. On shore there stands a memorial to the 69 men who lost their lives. For the outdoor enthusiast, there is a walking trail that will take you around the island. From this trail you can view Bell Island's many species of birds and other wildlife as well as enjoy the cliffs and ocean views. Check out Bell Island accommodations includes bed and breakfasts.